One of the more interesting responses to my recent Pop Mech piece on Air France 447 came from the Atlantic Wire, which took my description of the sounds and smells that the pilots experienced as a point of departure to discuss what the flight’s final moments must have felt like for those in the cockpit. 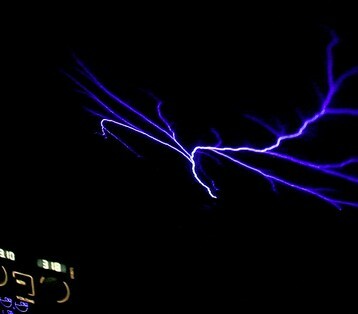 Here is a photograph that accompanies the post, showing the electrical phenomenon known as St. Elmo’s fire. I’ve never seen such a thing in real life, but imagine that it must seem both beautiful and worrying. Thanks to the cockpit voice recorder, we have a pretty good idea of what the pilots heard, and the instrument data gives us a pretty good idea of what they saw. But what about the passengers in the back? Their perspective was very different, so I’d like to offer a few speculations about what the final moments of the flight might have been like for them. The plane had taken off from Rio de Janeiro at 7.30 in the evening, local time, and had been flying for about four hours when it first encountered the weather system that would precipitate the final crisis. It was nearly midnight, then, by the internal clocks of most of the passengers; a few were probably reading, or watching a video, while the majority were probably sleeping, or lightly dozing. The captain himself had just left the cockpit to go take a nap. As the flight neared the line of massive thunderstorms straddling the Inter Tropical Convergence, any passenger who happened to be awake would probably have felt some light turbulence. Those looking out window would have watched the plane fly into a bank of clouds, then out into clear sky, and then back into clouds. At six minutes past midnight, one of the co-pilots made a call back to the head flight attendant, alerting her that the plane would shortly be entering an area of turbulence. He made no such announcement to the passengers, however. The turbulence grew worse. In the cabin, the flight attendants would have been strapping into their seats. As a frequent traveler, I’ve experience similar moments many times before: the sudden, unanticipated jolt, followed at irregular intervals by more lurches of varying magnitude. I invariably remind myself that turbulence alone has never caused a modern airliner to crash, but it does little to soothe my nerves. Fears are, after all, irrational, and there is something primally disturbing about being tossed around without any clues as to why, or when the next bump will take place. I imagine some passengers might have been roused from half-slumber; others might have tightened their seatbelt, or tossed back the half-finished drink to keep it from spilling. The main drama began at 10 minutes past midnight, when the speed sensors became iced over, the autopilot disengaged, and the pilot flying the plane pulled back on the controls, sending into a steep climb. The passengers would have had no explanation for the sudden lurch, nor would it have been easy for them to know in the minutes that followed if they were climbing or descending. One of the most difficult things about piloting a plane in darkness or clouds is the body’s inability to accurately determine its orientation or whether it’s going up or down; this spatial disorientation was the main factor behind JFK Jr’s death. Once an aircraft is in a steady descent or ascent, it feels just the same as flying level, just as an ascending elevator feels the same as one at rest. Few of the passengers could have guessed that after the plane reached its maximum altitude it began a very rapid descent. Indeed, even the co-pilots themselves, with their panels full of instruments and indicators, seemed uncertain as to what exactly was happening, several times discussing whether they were actually going up or down. Until the moment AF447 hit the water, none of the passengers could have known what was in store. It’s also worth pointing out that, though the plane several times achieved an angle of attack exceeding 40 degrees, this does not mean that the passengers would have experienced themselves as tilting steeply backward, like roller-coaster riders climbing the first hill. The angle of attack is the angle between the wing and the air through which it’s moving; the reason that the value was so high during AF447’s final minutes was that the aircraft was practically dropping like a brick. Its orientation, however, was only about ten degrees up. It probably didn’t seem that remarkable, or even noticeable given what else was going on at the same time. What the passengers would certainly have felt, and been alarmed by, were intense buffeting and turbulence. Remember, the flight was passing through the top of a major thunderstorm. Making matters worse was the fact that when an aircraft wing is on the edge of an aerodynamic stall, it naturally experiences a kind of buffeting, or trembling. Add to this the fact that a plane is very difficult to control at stall speeds, so the pilot flying the plane was making big side-to-side movements of the flight controls, causing large-scale lurches to the left and right. It’s a testament to the integrity of the Airbus that it withstood the forces it was subjected to; in his book Erreurs de Pilotage (Volume 5) Jean-Pierre Otelli makes the case that a lesser airliner would probably have been ripped to shreds. But it can’t have been an easy ride for the passengers. I know from experience that in heavy turbulence a moment comes when a particularly violent lurch seems to release the anxiety of the cabin en masse; a gasp seems to erupt from everywhere at once, and a contagion of fear takes over. People begin to cry, to pray, to quietly sob. All at once, everyone has entered a new emotional domain. One reader commented, shortly after my Pop Mech piece went up, that she hoped that the passengers hadn’t suffered. I think it’s true in a sense, that they didn’t know that the plane was doomed, and that the force of impact was so great that most or all were killed instantly. Psychologically, though, it must have been a terrifying ordeal — though for none quite as much as for the pilots, who alone knew what was about to happen to them. @JackR, if you’ve been a pilot for 15 years, how is it that you don’t know it’s a yoke, not a yolk? Yolks are the yellow part of an egg. In 15 years, you’ve never had to properly identify the yoke? Seems rather odd, or you’re not really a pilot. I would just like to comment that fears are not irrational. Fear is a gift that nature has given us to protect us and help us survive. Too often, people dismiss their fear to their detriment. Maybe you mean phobias? Fear of flying is a phobia. Any given moment. When I’m just dozing or want to relax I leave this channel on which got me wondering… If there were passengers like me on 447 would those monitors specs reflect what was going on in the cockpit? As an aviation enthusiast I would be alarmed by the speed of the both the plane and the ascent/descent , the latter of which would have me banging on the cockpit door. Remember the left hand PFD showed the correct attitudes through the whole sequence including vertical speed. I’m not sure what feed those monitors get but it’s not out of the realm of possibility that some passengers watched the planes wild ride on the map channel. What do you think? JohnLM, you do realise that the instruments weren’t working right? If they weren’t working in the cockpit, why would they work for you. Much of the indications in the passenger’s monitors get data from GPS so they would likely have been correct. Further the cockpit indications were correct long before contact with the water. Unfortunately this is another case of aviation’s penchant for relying on rote procedure and automation to the detriment of basic airmanship. Simulator training could go far in correcting this problem but, though changes have been made, they IMHO, are pitifully inadequate. Just the humble opinion of a 17,000 hour pilot with time in a bit of everything from gliders to fighters and heavies from both Boeing and Airbus. You probably won’t read this but I still wanted to thank you for answering my question with your proper technical knowledge. If the data comes from the GPS (which was working the whole time johnlmreply) then I gather a few of the passengers saw some of what was unfolding. It is a tragedy that the pilots let an overconfident malaise set in; no doubt something that had accrued for a long time, so when their skills were needed most they were hidden behind a fog of denial. The ground speed on the GPS was correctly registering from takeoff till the moment the plane hit the ocean. I still shake my head every time I think off the pilots skimming over their display and missing that all important number. Of course that’s just one of many head shakers that should have easily been addressed. Bonins actions will always lie in the crosshairs but it was the lack of CRM that truely doomed the plane and ended up being just another teachable moment for future pilots training. Carpenter’s planes should be mandatory to know if you are really going up or down and left or right when everything else fails to make sense. 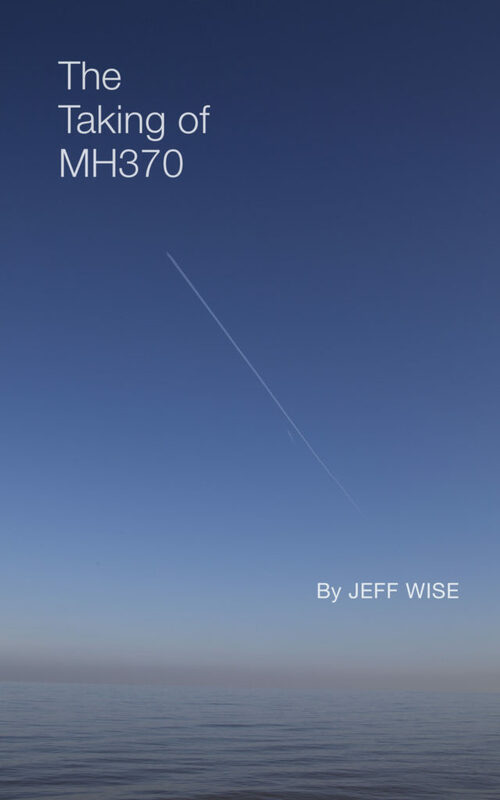 I read a very good book on this accident ” Understanding Air France 447 ” and it is my belief that ALL of the pilots were in a state of fatigue even before they left Rio. It states in the book that they were having a good time in Rio and the Captain told the 1st Officer that he would be doing most of the flying, well he had the least experience. So in my humble opinion they weren’t rested enough for this 12 hour flight that led to poor decision making,not thinking clearly ! I am also very surprised that the pilots did not innately know they were descending because a 10,000 fpm descent would be VERY painful in the ear department! Surely the passengers would have been able to tell that the plane was descending, in the same way that someone in a falling lift would know that they were falling? Jonathan, good point. I wondered about that myself. I hope someone can explain why you sense you are falling in a lift but not in a plane. The sad but crazy part about this crash is that if Mark Dubois had not left the cockpit during the most turbulent part of the flight, the plane would not have crashed. However, Dubois was sleep deprived and it was standard for a pilot to take a sleep break. We don’t know what Doubois was thinking when he gave controls to Bonin.